The growing in Unity Gals from previous months are in a Unity Bloghop!! If you haven't heard of Unity before, check the Facebookgroup Show and tell and the shop!! The red rubber stamps are amazing and the FB group is very friendly! First I made a background with paint and stencils from Jolande, then I stamped the flower on watercolor card, embossed it and painted with acrylic paint. Some inkspray on top of the flower to get a bit of shimmer. 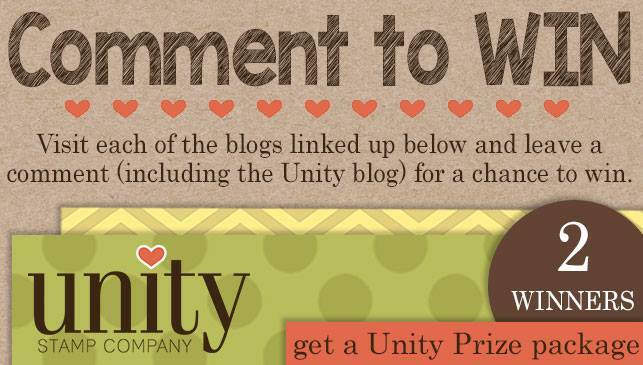 Now, to make a chance to win a Unity prize, comment on all blog, 2 winners will win a Unity Prize Package!! 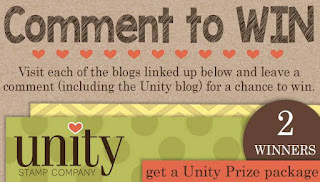 Hop along for a chance to win some Unity goodies!! This is beautiful! I love Jolande's stamps. I learned a lot from her when she came to visit Unity and did a lot of videos with them. This is beautiful. I will have to try this because I have the stamp set. This is so pretty. Love the colors you chose. They work so well together. Such a pretty combo of images, colors and texture! This is a lovely bright card, I love all the texture/patterns in the background. Magnificent ! so bright colors! Love the inspiration...I can see this in my head inthe colors I gravitate to...hot pinks and purples. Oh my what beauty! I love your background and choice of colors just a great job ! Your card is awesome, and the textures of your embossing give your card amazing depth and life. Thanks so much for taking part in this inspiring hop and showcasing Unity's fabulous new stamps. Fabulous card! Love the hot colors! We did a "some like it hot!" swap and used these colors and it was so much fun. I love the energy of your card and all the wonderful textures. Bravo! So different from what I typically see. Very nice! I like the vibrant colors and the shimmer. Love this card, colors and stamp set!!! So Awesome!! this is beautiful! love the colors and all the different mediums you used. I love your silvery embossed edges. Fabulous! Gorgeous card! Love the way you put it all together. Those terrific colors just explode with energy! Your card would make anybody feel better. This flower is one of my favorites! Thanks for sharing! Lovely piece! Wonderful combination of images! Pretty color combo! Love that embossed flower! Beautiful! I Love the flower you embossed! The colors pop off of your card, stunning job! Simply gorgeous!! Your colors are beautiful and so is your design. Thanks for sharing. Love your projects! The colors are so vibrant! A little work of art - very pretty and great color choice. Lovely card with beautiful colors. It just pops. Fabulous!! 😍 Love all the layers of mediums and colours! Love the rustic free style of this! Beautiful card. I love the colors and all the texture! Thanks so much for being a GIU gal! Nice! I like the texture! !